Clarets teenager Aiden O’Neill described the last week of his life as “spectacular” and “surreal” after being handed his professional bow by boss Sean Dyche. The 18-year-old followed in the footsteps of Jay Rodriguez, Chris McCann and Richard Chaplow having climbed through the ranks at Turf Moor to feature for the first team. The Australian midfielder, who arrived at the club from Brisbane Athletic two years ago, replaced Andre Gray as a late substitute as Burnley beat Liverpool 2-0 in the Premier League. A full debut against Accrington Stanley in the EFL Cup was next and then came an appearance at Stamford Bridge versus Chelsea, the team he supported back home. 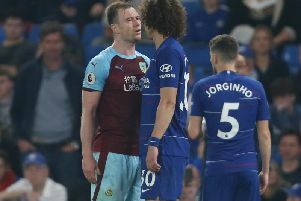 With the Clarets trailing by two goals in the country’s capital, O’Neill replaced record signing Steven Defour and locked horns with internationals N’Golo Kante, Nemanja Matic and Oscar in the middle of the park. “It’s been a very big week for me with Liverpool, playing in the cup and then Chelsea,” he said. “It’s what you dream of. “My debut happened so quickly. When I was on the bench I was buzzing and then when the gaffer told me to get my shirt on I was like ‘oh my God, I’m coming on here’. I just forgot about it when I got on to the pitch and it was alright. Speaking after the weekend defeat, he added: “This (Chelsea) was my team back home so it’s a very big day for me. It’s unbelievable. O’Neill, who signed professional terms in January, is a firm believer that age is just a number and he feels that he’s got the ability to help the Clarets prosper in the top flight. “It’s great but I try not to think about my age because when you’re out there playing it doesn’t matter,” he said. “It’s all about your ability.